You'll also get our free 7 day onboarding marketing training and the popular Bluewire News. Do you work with high-value clients? Bluewire Media helps high-trust, relationship-based business owners, like you, grow your pipeline, get more qualified leads that turn into high value clients that you love to work with. If you’ve got a weakness in digital marketing. We can help. 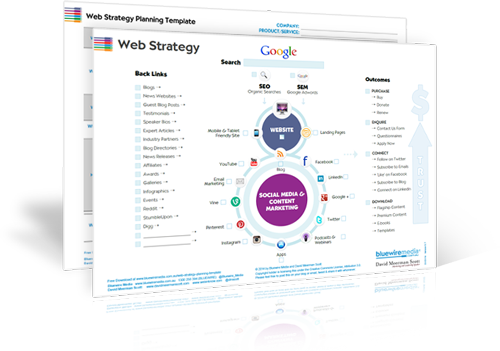 Download any of our 33 free marketing templates and read our book Web Marketing That Works. Watch our next webinar, attend a workshop event, or join our flagship courses. Would you like more inbound leads? Last year, Bluewire attracted over 5,500 unique inbound leads - the most of Hubspot's international partners. You can apply the same web marketing system too. Simply download our tools to begin your inbound journey! Check out our podcast, Web Marketing That Works -- the show for people who love marketing on the web. Buy our book, Web Marketing That Works: Confessions from the Marketing Trenches.